The Blackstone 3-in-1 Kebob Charcoal Grill is a little bit different than most of its competitors. Well, hold on a minute, because that’s not strictly true. The fact is the 3-in-1 Kebob Charcoal Grill doesn’t have any competitors because nothing on the market does what it was built to do. It stands alone as the only Motorized Shish Kebob/Kebab Grill/Smoker/Traditional Barbecue out there. So full marks for uniqueness from Blackstone. But is it good? Does it try to do too much? And is it a little too different to ever be taken seriously as an option? Guess what? I took a closer look and this is what I found. Blackstone describes the finish on this model as ‘professionally done’. I’d go along with that and for what it loses in terms of aesthetics, it makes up for in functionality. There’s a body made of quite a good grade Steel, with a domed Lid, and a black powdered finish to enable it to withstand extremely high temperatures. So while it’s not beautiful, it’ll surely last a long time. That said, it’s also not the ugliest Grill I’ve ever seen either. It’s rustic, rugged and if you believe Blackstone it’s determined to make you great meats. The wheels are kind of thin, meaning it doesn’t push along as easily as some other models. This is perhaps an issue they should have looked at prior to release. But, the price is also around 170 dollars, so it’s really cheap. The Motorized Kebab Turner comes fully assembled which was a good thing because it’s a complex device. Fortunately, you just have to slot in into the unit. The unit itself takes a bit of putting together. You’ve got to screw in the parts to make the Cart and screw the Lid onto the Grill top. It’s about a 1-hour job but you’ll only need to do it once so don’t panic. Although it takes time, the instruction book is very helpful so it’s an easy task. I’ll describe the three uses of this Grill individually so you get an idea of each one’s merits. The two words mean basically the same thing. Pieces of meat and whatever else you want to eat, thrown onto a Skewer and Grilled. Problem is, people often burn them. This is because Kebabs have to be turned regularly in order to prevent over-cooking on one side. 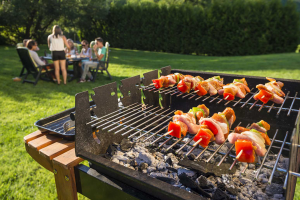 Most people don’t have the time or they get distracted and when they return to the Grill, they’re left with a bunch of black squares of meat. Not a pretty sight. 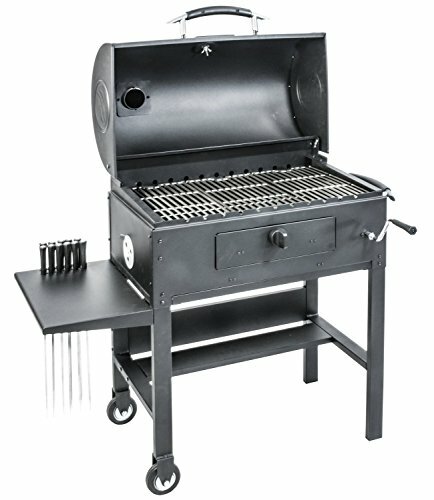 On the Blackstone 3 in 1, you just take out your Grates and replace them with 11, 23 inch Heavy Duty Steel Skewers that’ll turn the Kebabs for you while you kiss your spouse. It’s all motorized, so once you’ve slotted the Skewers in, you just press the start-up button and they start turning over the flames. It gives you a real restaurant style of Charcoal Kebab cooking that reminds me of the street food I ate in Turkey. Very authentic and easy. If you love Kebabs then this is the Grill for you. I was blown away by the taste this produces in Kebab cooking. If you’re making thick Kebabs, remember to space out the Skewers. Don’t put them right next to each other because they’ll rub and stop turning. Other than that have fun. Say you don’t want Kebabs today and instead, you want to do Steaks. Take out your Skewers, slot back in your Grates and you’re ready to go. Now, the Grates aren’t great. They’re good, but not the best I’ve ever seen. They’re made out of Steel and they come in three sections. Heat retention is just ok, so grilling is going to be a little slower but it cooks reasonably good food. I didn’t encounter any sticking or burning. The evenness was there and the food tasted good so I have no major complaint. Look, if they designed this thing with gorgeous Cast Iron Grates and a body that holds heat better, then it would be much improved. But, as it stands, I’m not blown away like I was with the Kebab grilling though. I am, however, well fed with tasty food and the traditional grilling experience on this thing was a relaxing one. Very simple to operate. Ok so imagine now you want to do some Kebabs, but you also wanna grill some Steaks while the Kebabs cook. You can do them at the same time on this. I really liked this option because it gives you a lot of freedom. As I mentioned the Grates come in three sections, so you can take two sections out and replace them with Kebab Skewers. And just like that, you’re Steak grilling and Kebab grilling both at the same time. Nothing else does this. Not as good as a dedicated Smoker. But for around 170 dollars I didn’t expect it to be, especially with the other uses. It has holes in the back so smoke does get out. A large amount of Smoke gets out so while you can close all the Vent’s and cover up the Chimney, it merits as a Smoker are still in question. The results are just reasonably good but not amazing. It’s not a gimmick. It’s a serious piece of equipment that genuinely can Smoke, Grill and Skewer Kebabs. The results are mixed with the Kebab grilling being the star of the show. But, traditional grilling on this produces pretty good results too. Not amazing results but for around 170 dollars, they’re certainly value for money results. As a Smoker, it’s just ok. You can Smoke but not nearly as good as a dedicated Smoker. Here’s my advice. If you’re not too interested in Smoking, and you want a traditional Grill with the super tasty Kebab extra thrown on top, then you should buy this. If you’re not a major Kebab eater, or if you definitely need a Smoker, then give it a miss. There are lots of people who have dreamt of Kebab cooking like this so they’ll think it’s fantastic. Others won’t. Thank you for reading.